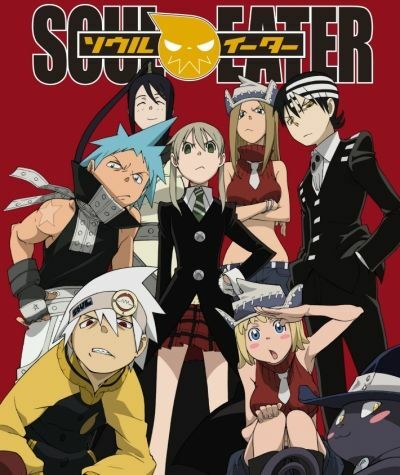 Soul Eater is one of those titles that you have definitely heard of, but may not have seen. It’s simply around and every anime fan gets around to watching it at some point. It’ll either live up to the hype or it won’t. I’d say that it ended up being a very good show. It had a bit of a rocky beginning and a rocky middle, but most of the series is simply very good. It has certainly earned its solid reputation as a great action show. The kids study at Death Academy on how to be great meisters/weapons. There are two types of people in this world. Those who are born as sentient weapons and those who are the normal humans who control them. We have 7 main characters, three humans and four weapons. They just want to be the very best and a weapon’s ultimate dream is to consume 100 souls so that they can become a Death Weapon. So, they go around vanquishing evil spirits, which takes up most of the pre arc. The first real arc involves the witch known as Medusa. She has assembled a team of super villains (Naturally, one of them is a Werewolf) to infiltrate Death Academy and awaken the ultimate evil of legend….The Kishin. Death can’t have this so he sends the kids after her. Let’s see if they can do this! The second arc is much more complex as we have a lot of plots lying around. Medusa is still up to her evil tricks, but she is no longer the main target of the heroes. That honor goes to her sister, Arachne. She wants the Kishin’s madness to consume the entire Earth and she has a very large organization that will do her bidding. Each of the heroes is currently facing his/her demons so they’re rather preoccupied at the moment. Trust has been broken and many old villains are showing up as well. With one of their comrades going off the deep end, Death City’s inhabitants may be stretched too thin to really do anything about this predicament. First off, let’s look as the music in this show. Soul Eater’s soundtrack is definitely great and I’d give it a 4/5. Both of its openings are catchy and rank up there with the best openings. The second one in particular is a pretty fast paced rock song that transitions pretty well from fast to slow and vice versa. A pretty good battle theme is also used a few times throughout the series. One scene that comes to mind on this is Maka’s battle against Jack The Ripper. I instantly loved the song and that was only the start of the epic array of themes to come. Black Star’s theme is a very good inspirational piece and Death The Kid’s works well for fights. It actually does feature rapping, but you are too focused on the battle to hear what is being said. So, I can’t totally vouch for it but it works in the moment. Soul Eater’s animation is definitely very good. It isn’t as flashy as you would expect for a modern battle anime, but it makes up for this with how smoothly the scenes transition from one moment to the next. No shortcuts are taken with the animation here so you can look forward to some great fights. You definitely feel the blows as if this was one of the great shows from the 90’s. The character designs are top notch as well and I don’t recall any bad animation here. Speaking of the fights in the series, Soul Eater has a pretty diverse selection going for it. The three main characters have different fighting styles that help to make fights against the same person feel different. A good example of this is Krona. He battles Maka and Death The Kid, a short range and a long range fighter. Needless to say, it is a pretty fun contrast. (Even if Kid was using a lot of hand to hand in that battle…) There are a lot of characters in the series so there is never a long period without action. The longest period that I can think of would be the start of Arc 2 and that was one of the lowest moments for the show. The battles against Crona and Mifune are typically the highlights of the series, but we can’t forget about Medusa or the Kishin either! Unfortunately the show does fall into the fanservice trap. This is particularly present in the first few episodes and then it starts to die down. The author probably just wanted some quick ratings so he choose to take this route, but it is never the right call. We have the generic hot springs scene, and many chest gags that can be pretty sad to watch. I think it is safe to say that my hopes for the series were pretty dimmed after the first 3 episodes. There is still some of this in the series as it goes on, but it rarely happens so I’m glad that the show managed to nearly eliminate this negative by the end. The overall atmosphere of the show is pretty similar to Blue Exorcist or early Naruto for the most part. The series is pretty light with a lot of serious fights. This changes in arc 2 of the show. It tries to be a lot more solemn and dark, which doesn’t totally work. We get a whole episode about Stein turning crazy and another episode about Medusa wrecking lives as she shape shifts. Those are 2 of the episodes that I remember disliking and there may have been a few more before the show hits its stride again. I remember watching the show stay in its slump for what felt like forever, but I had been watching it weekly so it probably wasn’t all that bad. A few episodes was all that it was before the show went back to what it did best, solid fight scenes! The tone shift does work at some points though like with the brilliant endings, but other episodes are simply wasted. This show may have the record for the most episodes in a row with a great cliffhanger. The climax is full of them and it is great. Once again, I have to mention the end theme for the episodes. It’s easily the best end theme of all time and I doubt that it’ll lose that title anytime soon. Maka is basically the main character here and she is definitely a good character. She has her flaws to be sure and I ultimately prefer Black Star, but she does beat Kid. She likes to study and she is determined to become a great Meister while the other main characters typically do not care or worry about such things. She becomes obsessed with stopping Medusa as the series comes to a close and it definitely upgrades her as a character. Unfortunately, her rage moments typically do not help her claim victory. She has to battle a lot in her soul to keep from getting infected with the madness and the fear abilities that the villains use and it is definitely a weakness for her. She ends the series on a high note and that’s always a good thing. One of the reasons why she is a good character is that she is very well rounded. She has her issues to be sure, but none of them involve her going too far or doing something that would make me lose respect for her. She still strives to be a hero and she gets a lot of great moments during her fights. I’d compare her to Misaka from Railgun. I’m still more of a Misaka fan, but Maka’s pros and cons are pretty similar to the thunder lead. A lesser main character could have hurt the series since characters are very important here so the author did a good job of choosing her as the main member from the three groups. Soul is her partner and he always likes to be cool. He can turn any part pf himself into a blade, which definitely comes in handy during a fight. He has even more trouble with the dark side than Maka and it overpowers him more than once. He still does manage to get through it in the end and he is a pretty loyal friend. He is definitely another solid character. It would have been cool to have seen him fight on his own some more, but he is used to being a team player. He actually has a backstory, but the show never really goes into it. It just pops up once in a while. Black Star is the best character in the show and it isn’t even close. I have to say that his voice definitely clashed with his personality at first. One can make the case that it still clashes and that I have just gotten used to it. It is hard to say for certain if that is the case, but I still do like the voice now. (I can definitely admit that Kirito’s voice would have been a lot more appropriate) He is a lot like the Naruto from the old days. He prefers to fight someone than to think of strategic ways to win and he is always brimming with confidence. Unlike Naruto, you can safely say that Black Star is an all star right from the get go. One can make the case that he is definitely the strongest from the main three pairs and I would agree. He doesn’t hesitate to abandon protocol to avenge his friends like when he attacked the enemy base on his own. He has all of the traits that you would want to see in a great character and any appearance by him is typically awesome. Kid is a pretty good character for the most part. You really just have to ignore his first appearance and then he’s a pretty solid hero. His fighting style is pretty unique and I actually don’t mind his symmetry gimmick. I do think that it can be very overdone at some points since he’s more interested in that then fighting, but that goes away during his serious fights of course. One frustrating thing with this character is that he is said to be very powerful, but we rarely get to see him exhibit this. Either he’s holding back or there’s not a tough character for him to fight against. His final smash during one of the final episodes isn’t all that impressive considering how long it takes him to charge up the move. He’s pretty good, but he’s definitely more suited to being one of the supporting character than the main character. He wouldn’t be able to hold his own series the way that Maka or Black Star could. His father may be Death/Shinigami, but he’s not as cool as you may expect. We learn that he was a pretty fierce fighter back in the day, but he didn’t want to scare the kids so he decided to start being more of a comic relief character. That doesn’t really change so that’s how he acts for the whole series. 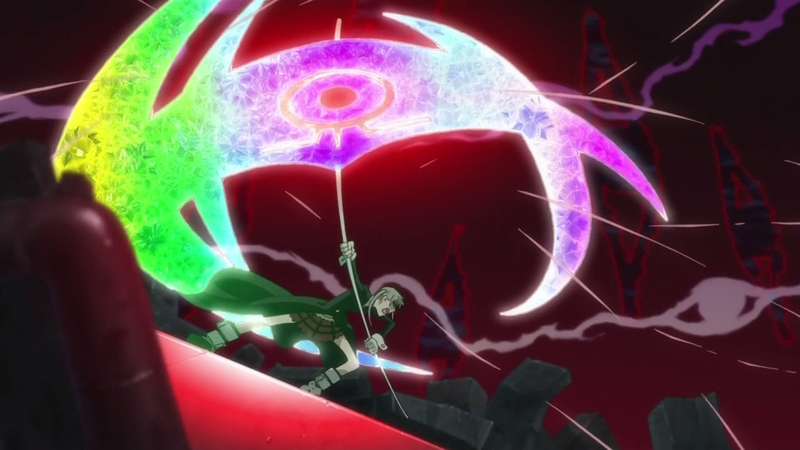 He does get a pretty good fight against the Kishin though so he does add to the story. He’s also pretty shady in the second arc and you start to consider that he may actually be an antagonist. He’s not bad compared to most comic relief characters, but he would have been more fun in his true form. It’s a shame that we only get to see it in flashbacks. Professor Stein is the teacher for the main characters so his role is similar to Kakashi’s. He’s meant to be a pretty experienced and level headed fighter who bails the kids out of a tough spot once in a while. The problem is that he’s just not as likable as Kakashi. One of the reasons why I could never be a fan of him is the fact that his gimmick is a little too evil. He likes to dissect things and people and it’s something that he never gets over. It’s typically used in comic relief of course, but then he gets a subplot in arc 2 about the madness consuming him. Let’s just say that his willpower is not enough to help him out and he keeps on reverting to his old ways. He definitely looks good when he fights, but he hinders the heroes a whole lot more than he actually helps them. I’d take Captain Bravo from Buso Renkin over Stein any day…and Bravo made a huge error of his own at the end of the series. Sid is an assassin on the side of the heroes and he’s not bad, but he’s not great either. He’s your average “government lackey” character who just follows orders without asking questions. He’ll do anything that the Shinigami asks him to do without hesitation. He definitely doesn’t mind destroying his foes and that’s why he’ll never be a true hero. He’s just a hit man who happens to side with justice..for as long as the Shinigami does anyway. I also probably dislike the fact that he gets a little too much hype sometimes. There’s no way I can believe him taking on Mifune in an even fight. That’s just not going to happen and he actually holds his own for a while…the very definition of plot hax! Tsubaki is Black Star’s partner and she gets more development than the others. She’s always very polite, which helps her put up with Black Star’s big talk about becoming the greatest someday. Naturally, this means that she has a tragic history and she gets her own episode about it. We get to see how she can do battle without a meister and she’s definitely a tough weapon. She’s definitely more likable than Kid’s partners although I think Soul is still better. Tsubaki’s a weapon that you definitely want to have on your side. Patricia and Elizabeth are the partners of Kid and they’re easily the worst ones. I don’t actually like either one of them. One of them plays the role of the happy fighter who is usually very sweet, but can turn serious at any moment and the other one is afraid of ghosts. They just don’t add anything to the show. They have a backstory, but it’s only briefly looked at so it barely counts. I think the author was probably just running out of main character ideas so they were just thrown in at the end. Still, not all of the weapons can be great right? Marie joins the series towards the end and she’s one of the legendary Death Scythes so she’s definitely powerful. She uses a hammer to fight although we don’t see that until we’re nearly at the final episode since she rarely does fights. She’s definitely not my favorite character in the series. She does a pretty bad job of watching over Professor Stein and then her attitude towards Crona isn’t great since she was practically begging to be betrayed. I definitely didn’t care for her from start to finish. Justin is another Death Scythe and he has a rivalry with Giriko. They get to fight around 5 times and just about each round is a stalemate. You’d think that Giriko would quickly win since the matchup just doesn’t seem even, but I guess Justin is just tougher than he looks. His attacks are all pretty fancy and he’s always listening to music. It’s a pretty fun gimmick and he definitely loves to mess with Giriko. He’s probably a little too devoted to helping the Shinigami out since he treats him like a god, but he’s still a pretty good character. Spirit is definitely a bad character and he also doesn’t add anything to the story. He’s the Shinigami’s partner so he makes for a good weapon, but his personality is annoying. He’s like James Bond and Captain Kirk in that he’s always into physical desires without worrying about nobility. There’s a reason why his daughter isn’t a big fan of his. It’s heavily implied that his playing around is why he ended up getting divorced. He tries to have some cool moments, but I definitely didn’t like him. Excalibur is an intriguing character who pops up once in a while. He gets two episodes devoted to himself so he’s probably a fan favorite. He likes to talk a lot, but anyone who can get past this will gain a whole lot of power. It’s never been used in a serious situation, but that’s just because nobody can deal with him. Excalibur seems to like annoying people so he may even be doing it on purpose. Unfortunately, this means that he’s basically a filler character. He’s decent, but he just doesn’t add anything to the show. Time for the 3 big villains of the show. 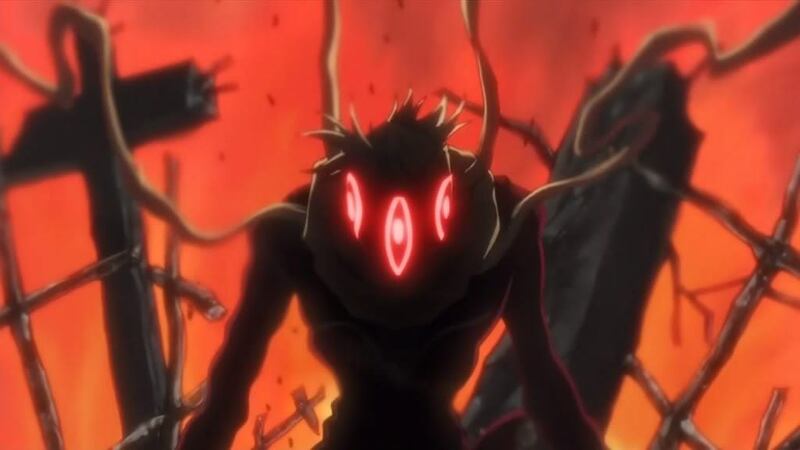 Asura, also known as the Kishin, gets a pretty big role in the climax of both arcs. He’s a powerful fighter and his fighting style is similar to the average DBZ villain’s. He shoots a lot of energy blasts and he’s also good at hand to hand combat. Unfortunately, he turns into a huge being at one point so his fight scenes take a slight dip, but they are typically pretty great. He’s a solid fighter, but he’s a pretty bad villain. He’s afraid of just about everything and the way that he loses is pretty bad. Ah well, I guess I’ll still take the fights! Arachne is the mastermind behind the second arc, but she mostly hides behind her minions. When push comes to shove, Asura and Medusa are great fighters. Arachne seems like she is a tough fighter based on her first appearance where her nail is able to block a blade, but it seems like that was just fake hype. She never looks impressive like that in the show after her initial appearance. It’s definitely disappointing for her fans since she had started out on such a high note. Everything went crashing down for her from there. She’s definitely not my kind of villain either. Luckily, Medusa is much better than the other two villains. She convincingly plays all of the heroes for potatoes as she infiltrates the school as a nurse. Her vector plates make for a very lethal ability since she can combine it with her striking power. A single cut can do a lot of damage and it’s tough to dodge her attacks when you have to watch your step as well. She’s definitely pure evil and she’s always thinking of a way to make life miserable for someone. Medusa always talks tough and she’s basically how you would picture an enemy leader. She always has a backup plan in case things go sour and it’s really hard to take her down for good. As long as one piece of her remains, you can bet that she’ll survive. The one thing that hurts her character is really that she forces us to watch an animal violence scene. It’s the only one that I can remember although there may be more. It’s still pretty sad either way since it was rather unnecessary. Beyond that, she’s a pretty good villain. Giriko is pretty tough and I definitely liked him as a villain. He’s very skilled and he typically overwhelms the heroes with his razor sharp attacks. He can move at high speeds without any difficulty and he can keep on fighting for long periods of time. He is also not afraid to talk back to the higher ups and he’s constantly antagonizing Mosquito. He’s the rival type of villain that you always look forward to in a show. (Like Grimmjow) It’s a tough call, but I’d say that he’s the best villain in the show. Mifune is Black Star’s rival and they get to fight several times. That’s one of the perks about a show being 51 episodes, there’s plenty of time for rematches. Their fights are all pretty great although I’ll always consider Black Star to be the better fighter. I can safely say that he doesn’t win all of the fights so that can be a little hard to take. The third fight also heads into dicey territory as Black Star starts to lose it, but luckily we get a shonen moment to diffuse that. Mifune is pretty noble and he’s only on the side of evil to protect a little kid. She’s definitely a liability for him and the villains take advantage of it. So, I guess he’ll still be in the villain category for now, but he’s very likable and it would be nice to see him team up with the heroes someday. Mosquito is one of Arachne’s minions and he’s decently tough. He has a rivalry with Giriko so it’s nice to see that he’s not just all talk. He can transform his body to past states, which can be very useful since he was an excellent fighter back in the day. The anime doesn’t get to show off all of his forms since it diverged, but he still looks good. It’s hard to buy the fact that he is holding off all three of the main characters, but I guess that’s some good hype for him. He’s a pretty good villain. Eruka mostly gets spends her time getting bullied by Medusa the whole time. Her fate is pretty sad in the series and especially when you consider the fact that there really isn’t a way out for her. She got into this witch business and now she’s paying the price. She’s not a good fighter so she mostly just executes the peaceful parts of the plan. Like blackmailing other villains and infiltrating hideouts. She’s definitely not my kind of villain though. Free is a werewolf who is pretty skilled. He can regenerate, which comes in handy and he has a pretty unique cube ability. He can’t really control it though so he can be a risky ally to have in a fight. He’s also the kind of guy who typically loses. It’s just hard to have confidence in him even though he’s technically powerful. 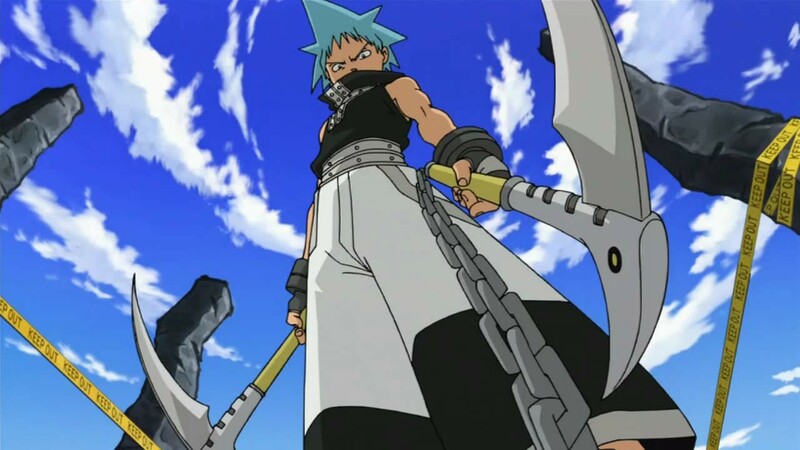 His strength and speed are considerable and he was able to take on Maka and Black Star at once. We know that he’s pretty evil from his back story, but on screen he actually seems like a pretty likable character. He’s definitely one of the more fun villains. Blair is a witch who appears in the first episode of the show and she’s not a great character. She is mainly used for fanservice and she rarely ever gets to fight. When she does, it’s typically against a weak villain so she’s not really contributing all that much. She’s technically a strong fighter, but she just doesn’t show off her abilities very often. The show would be better off without her. Soul Eater diverges from the manga during arc 2, which was definitely a risky move. 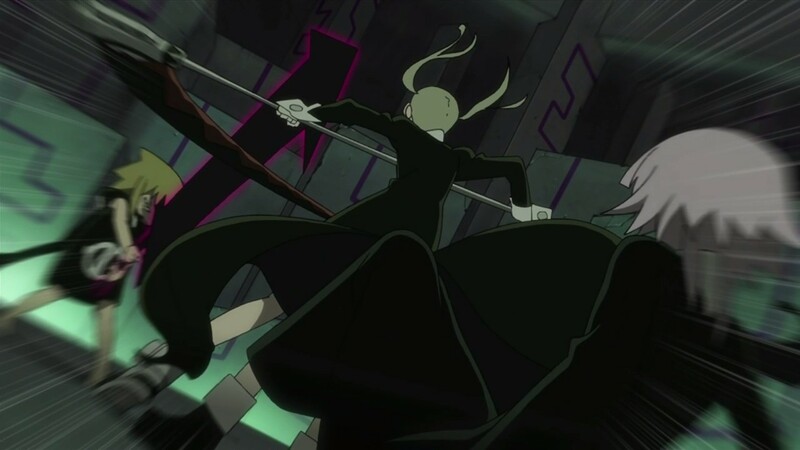 It paid off in a few ways like Maka’s new super form and the array of epic cliffhangers, but there were many ways were it failed. One of them was the fact that Arachne was basically thrown to the wayside and the ending of the series is also very anti climatic. I’ve never seen an anime end with plot hax that was out in the open like this one. Usually, there is some subtlety in how it’s handled, but not here. Let’s just say that the power of friendship wrapped in a punch will always be able to save the day. It’s fun for the main characters, but it’s definitely not a great way to end the series. I haven’t finished the manga yet, but it’s safe to say that the manga route is better thus far. The show probably would have had a better time if it had stayed true to the manga since it would have avoided some of the episodes during the slump, but I still did love a lot of the cliffhangers and epic moments at the end. There are pros and cons to it naturally so you can look through this paragraph and see if the pros outweigh the cons or not. We definitely missed out on a lot of new villains with the filler ending, but at least the Kishin finally got to fight. Overall, Soul Eater is a very good show. We get several glimpses of greatness from it and it would have been an easy 8 if not for a slump that lasted for a few episodes and the excessive fan service in the earlier episodes. Those do take it down a few notches to the point where it was a tough decision. It is safe to say that Soul Eater can defeat most of the other 7 star shows and that it would lose to the average 8. I think it can squeak by to the higher rating and I just advise you to be wary of the first three episodes….or just skip them altogether. I definitely recommend this title if you can get past the early fanservice and don’t mind the dark tone that comes in for a few episodes. Beyond that, it is basically nonstop action with a very interesting cast of characters. The great soundtrack and animation also help the show to stand out in a crowd. Afterwards, we will see how you think it compares to Naruto. This entry was posted in 8 Star TV Shows, Reviews, TV Show Reviews, TV Shows and tagged Action, Anime, Anime Review, Black Star, Death The Kid, Kishin, Maka, Medusa, Review, Soul, Soul Eater by dreager1. Bookmark the permalink. Yeah, it’s off to a pretty good start. I’ll definitely be seeing this show from start to finish. I’m always up for some great sword action!